You will remember last week I told you about the home-made pickled ginger I made for sushi. 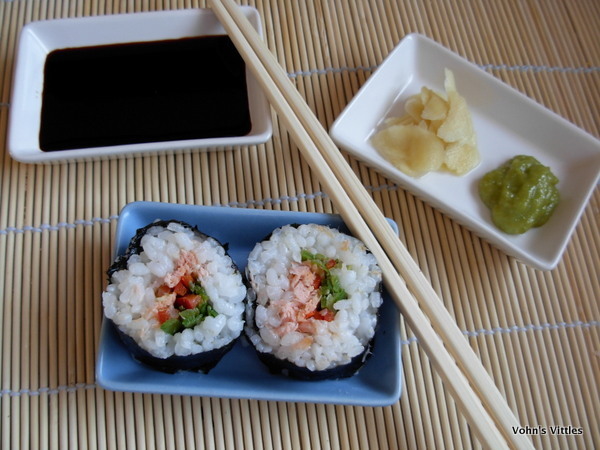 Today it’s all about the sushi I made to go with it! I have never been to Japan, so I wanted to do a bit of research before making my own sushi. I discovered that if you visit Japan, you will find sushi masters whose skill is unrivalled, whose training has taken many years and whose dishes are bound by centuries of tradition. However most of the sushi we eat here in the UK is really quite different to traditional authentic sushi and we often use ingredients that would rarely be used in Japan. In some ways this could make us home cooks think we have no place in the world of sushi-making. However the other way of looking at it is that there are no rules for making sushi here, so you can do what you want and include the ingredients of your choice. So, that’s what I did! 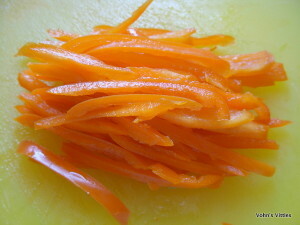 I prepped my favoured fillings and loved what I created. It may not be authentic but it sure is tasty! 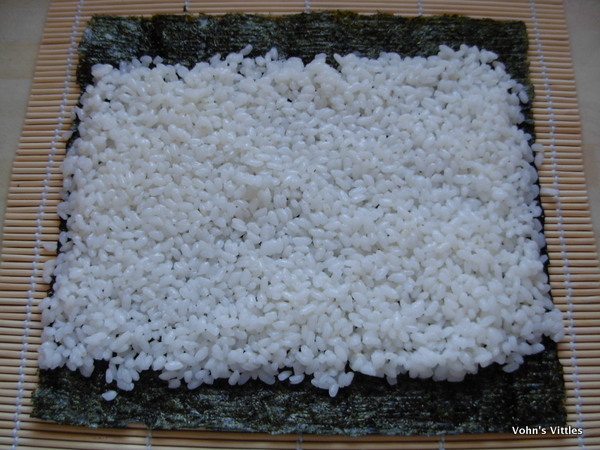 The ingredients you will definitely need are nori and sushi rice. 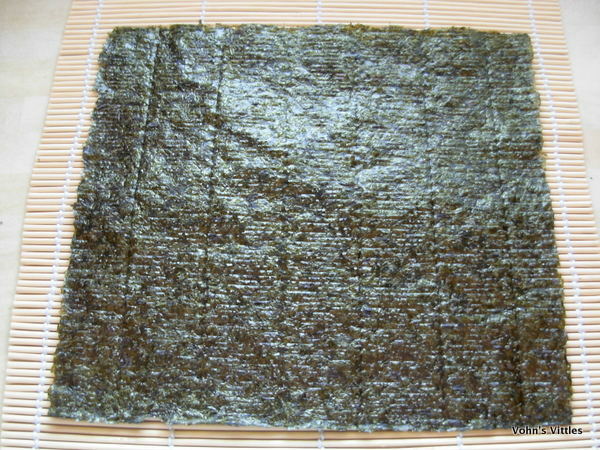 Nori is edible seaweed and is the same variety of seaweed as that used in Wales to make laver bread. The seaweed is harvested, roasted, shredded and dried into flat paper-like sheets. 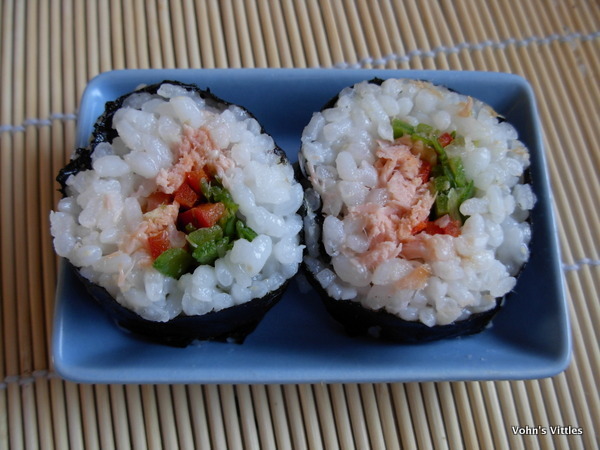 Sushi rice is the most important ingredient in sushi, as the word sushi actually means vinegared rice. 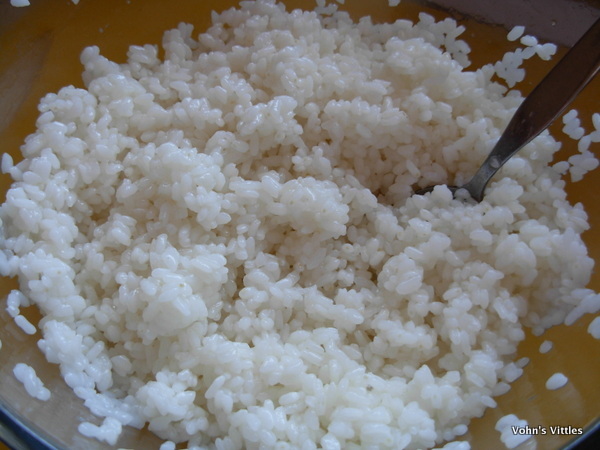 Sushi rice is a short-grained rice, which is cooked and then cooled and then seasoned with rice vinegar, sugar and salt. 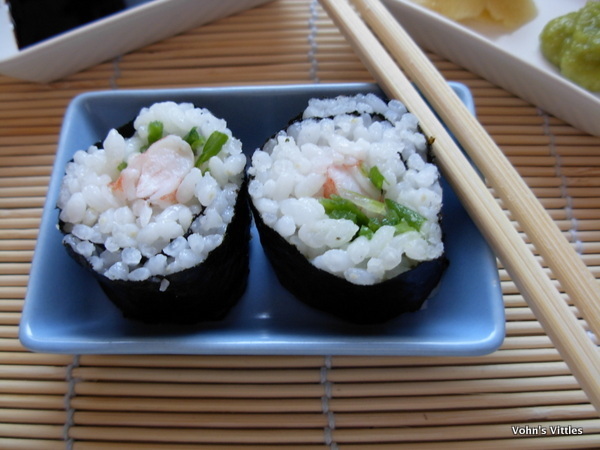 It can take several years of training before a sushi apprentice in Japan is even allowed to make the rice! So, then to the fillings. What to add? Well this, dear reader, is where you get to experiment and play with flavours and ingredients that you prefer. The key thing is to have some contrasting colours so they look pretty and to slice all your ingredients into fine strips. I used prawns, smoked salmon, spring onions, red and orange peppers, mangetout, and pickled ginger. Once you have prepped all your ingredients, it is time to get rolling! First of all you need a bamboo rolling mat (you could use a sheet of tin foil but the mat is much easier). You will be rolling the sushi away from you, so lay the mat down so the bamboo strips are parallel to you. 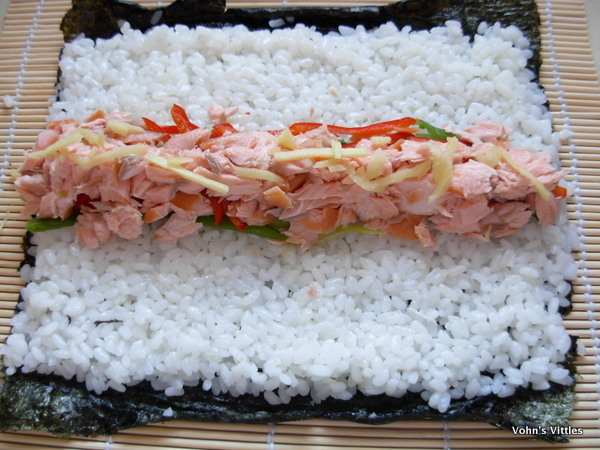 Then lay the sheet of nori down with its longest side next to you – as this means the sushi roll will be narrow and delicate-looking and also that you can cut more slices of sushi. Next place on a layer of sushi rice, spreading it out quite thinly and leaving a 1cm gap at the edges closest to you and furthest away. 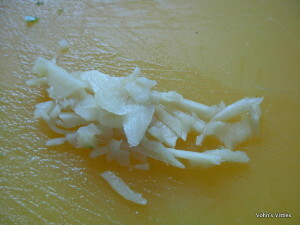 Now place a strip of fillings in the centre. 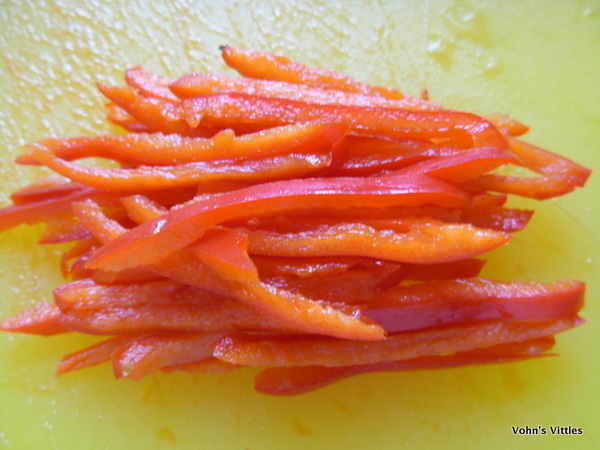 Here I used red and orange peppers, mangetout, smoked salmon and a little pickled ginger. In Japan the sushi master decides how much pickled ginger and wasabi (more on that later) is appropriate for each combination. Here you may prefer to err on the side of caution, especially if kids are dining too, and serve extra pickled ginger and wasabi on the side for those who like it hot. Next hold the edge of the bamboo mat which is closest to you and lift it up and over the filling, so the rice covers the filling. 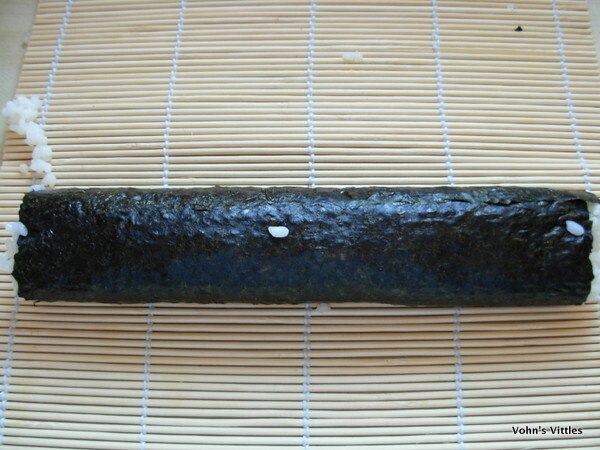 Tuck in the edge of the nori and continue rolling until you have a long roll. 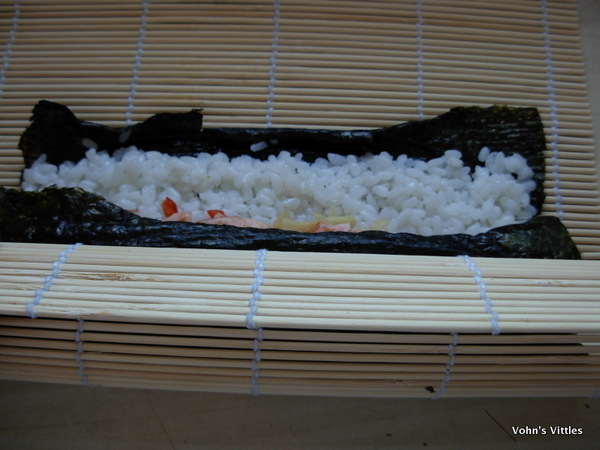 Use a little pressure with the rolling action, using the mat to help shape the roll, so the rice sticks around the filling and the nori holds it all together. 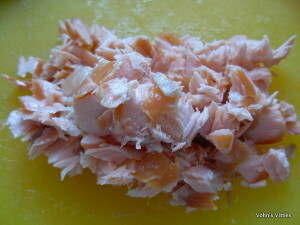 Now roll the sushi “log” onto a chopping board and slice it with a sharp knife into sections about 2cm thick. 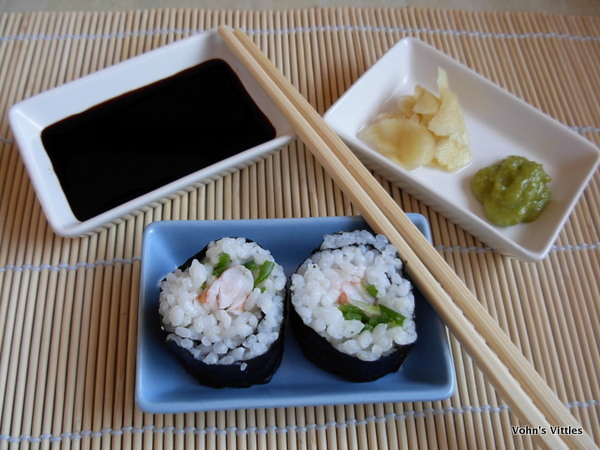 I served my sushi with little dishes of soy sauce, extra pickled ginger and wasabi. 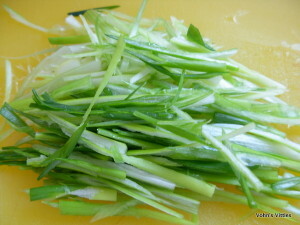 The green splodge beside the pickled ginger is the Wasabi paste. 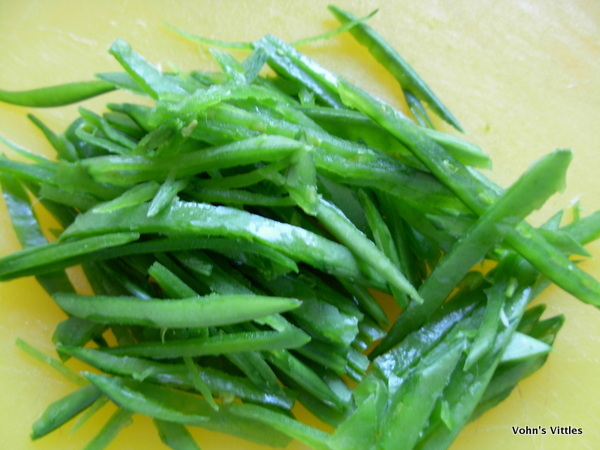 It is a Japanese root vegetable, similar to horseradish but is very difficult to find and, even in Japan, is commonly substituted with horseradish. You will find “wasabi” in most supermarkets now but if you check the ingredients you will find it is mostly horseradish. Do let me know if you find authentic wasabi anywhere as I adore it! I think I may have to grow my own! The next roll I made had prawn, mange tout, spring onion and pickled ginger. Another nice thing to do is to shape the rolled sushi. It is common in Japan to serve things in as pretty a way as possible, so I made a little flower by squeezing the ends of the prawn sushi rolls to form a tip with a curved outer, like flower petals. 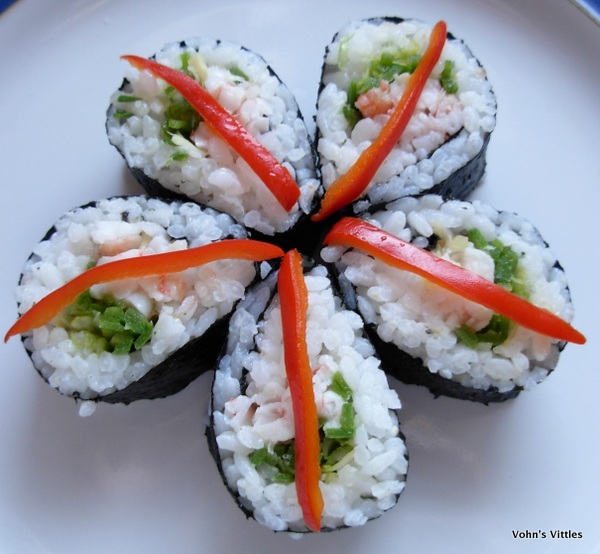 Do you like my sushi flower? My sushi may not be authentically Japanese but I devoured it! P.S. I am entering my sushi into the “Made with Love Mondays” challenge run by the Javelin Warrior over at Cookin w/ Luv. 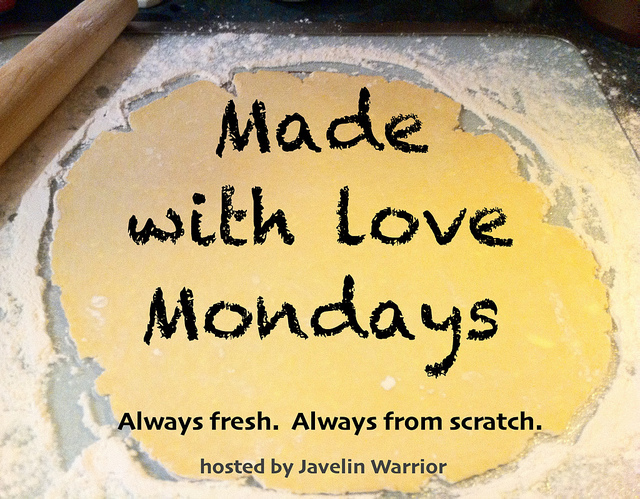 I love the premise of this challenge, which seeks to promote dishes made from scratch, using fresh ingredients with no transfats, no food dyes and no high fructose corn syrup. That is most definitely my kind of food! I’ve been wanting to roll my own sushi for a while. You gave such a great tutorial that I think I will try! You make it look SO EASY! Beautiful photos! Oh I love sushi. This looks very pleasing indeed. It’s great when you know how to do something lovely like this isn’t it? Love the sushi flower.